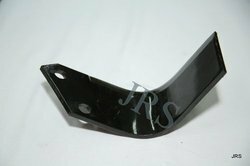 We are one of the most reliable companies in this domain and are into offering Tractor Rotavator Blade. We Offer High Quality Rotavator Blade with Competive Price and Quality. We are offering MS Zerovator Blade to our clients. We are providing to our valuable customers a wide range of Rotavator Blades. We use superior quality raw materials for manufacturing the Rotavotor Blades which make them very endurable and long lasting in nature. They are available in a wide range of variety and specifications as per the requirements of the valued clients. Being the leading names in the industry, we are manufacturing an extensive range of Rotavator Blade. 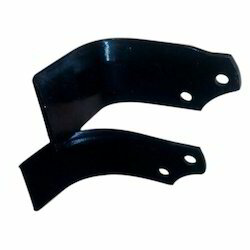 We make flat which is used for making rotavator blades, from ingots made in our own manufacturing plant using best quality raw material and state of the art technology, so as to ensure the quality of the product.We have inhouse spetrometer of GNR, which helps us to make the perfect composition of the product. WE ARE MANUFACTURING BLADE IN BORON STEEL WITH EXTRA ELEMNET IMPLEMENTED WHILE MANUFACTURING THE BLADS FOR LESSER WEAR & TEAR .WE USE ONLY BILLIET AS RAW MATERIAL BEING PURCHASE FROM INTERNATIONAL CO.